Nearly 2,000 years ago, a miraculous star shone in the sky to signal to all the world that Christ, the Prince of Peace, had come. This Christmas, take your church along on a breathtaking journey to “follow the star”, exploring the exciting days leading up to Christ’s birth and the life-changing messages of hope, love, joy, and peace His coming brought to the world. The Star is a 5-week Advent series featuring customizable sermons, powerful videos and other support tools to help your church connect your audience with the true meaning of Christmas, deepen their faith and build anticipation in the weeks leading up to Christmas Day. Start your five-week series on December 2, and take your members and visitors on an unforgettable journey of hope, love, joy, and peace. Mary and Joseph took the first Christmas journey 2,000 years ago, and Jesus' humble birth was not what the people of Israel were expecting. The people were weary of waiting for their Savior. Sometimes we also give up too soon on what we're believing for. Often, God shows up in surprising ways. This series invites people to follow the star, with life-changing discoveries along the way. New powerful videos and matching graphics coupled with relevant sermons for each week will make this a meaningful season that will make a lasting impact. This digital kit contains everything you need for a powerful Christmas Eve service. The customizable sermon - "The Star: A Journey to Christmas," ties that first Christmas journey of Mary, Joseph, the wise men, and shepherds, to our life's journey today and how He offers us true hope, love, joy, and peace. The powerful videos are perfect for showing in your services, and on your website and social media. This is a Christmas Eve celebration that your church and visitors will remember for years to come! This Christmas, give your members and visitors an impactful gift that will help them find the miraculous in each of their journeys. This 30-day journey includes daily devotions for the four weeks leading up to Christmas based around the Advent themes of hope, love, joy and peace. There is also a section of readings and activity ideas for celebrating Christmas Eve and Christmas Day. Make a big statement with this large 9'8" x 7'2" banner. Great for stage areas, in a classroom or other large meeting space, or in your lobby behind a table. It can also work as a room divider. Choose from two styles: standard indoor fabric with pole pocket finishing or non-wrinkle stretch sleeve fabric for use with the jumbo Click-it stand. 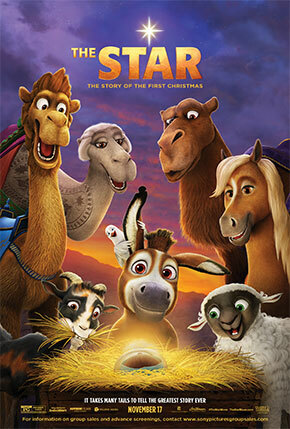 A fun, 4-week series for kids featuring movie clips from Sony Affirm’s upcoming animated movie The Star. It’s perfect for Sunday school or mid-week classes, with lessons and activities for ages 3-6 and 7-10. With a sing-along song for each week, craft ideas, coloring sheets based on characters from the movie, a Leader Manual, 4 The Star movie clips, a Promo video, web & social media graphics, and a planning guide, this digital download kit is everything you need to host a fun and memorable children’s program. Note: this kit does not contain The Star movie.